Joy Larkcom describes Hamburg Root Parsley is an ‘off-beat vegetable’. Although not as common as other root veggies, parsley root is extremely delicious and deserves to be better known. Very easy to grow, both the leaves and root are edible. The root can be left in the ground all winter and dug up as and when your Sunday roast requires. The luxury of having plenty of leaf parsley to go and snip from the garden even in December and January can’t be overstated. It’s high time this dual-purpose ‘off-beat vegetable’ was resurrected. Parsley Root 'Berliner' has edible large flat, parsley-like leaves but should not be confused with common curly parsley or Italian flat leaf parsley, as neither produce edible roots. It is a specific variety grown for as a root vegetable rather than an herbaceous green. The roots have the potentially misleading appearance of a small parsnip, about 15cm (6in) long and 5cm (2in) wide. Their shape is cylindrical and tapered in muted tones of white with furrowed textures; yet that’s where the similarities end. 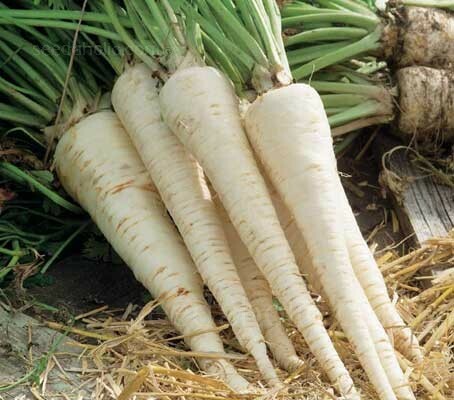 Its taste is quite different from parsnip, it is sweet, tender, without any of the earthiness of a parsnip - rather like a carrot that’s been cooked with parsley for flavouring. It’s intriguingly, deliciously different. In Europe 'half-long' types, which are more stubby in shape, are preferred, as being easier to use in cooking and grow better in heavy soils, where longer, thinner types might fork. Parsley Root is very common in Central and Eastern European cuisines, particularly in winter recipes. It is available year round with a peak season during winter and is used in soups and stews, or simply eaten raw, as a snack. The root is snappy, yet tender when raw, and smooth and creamy once cooked. It works particularly well in combination with other roots and tubers such as carrots, potatoes, turnips, and onions. Use parsley root in braises, soups, stews, and vegetable mixes to add depth and aroma. Parsley Root is a biennial grown as an annual. The seeds can be sown directly where they are to grow in March to May to mature by late summer. Early sowings may benefit from cloche protection. The roots require a long growing season to fully form. If you're particularly partial to Hamburg parsley (and you will be) you can also sow a crop in mid-summer, cultivate over winter and harvest early the following year. Sow in drills 15mm (½in) deep and 25cm (10in) apart, directly into finely-prepared, light, fertile soil, which has already been watered. Germination is slow, so sow 3 to 4 seeds in clusters and sow radish between stations to mark your crop. When the seedlings have developed, thin to one single, strong plant about 20cm (8in) apart. Because these roots are smaller than most, Hamburg root parsley can be grown in containers if they are deep enough. Keep your container out of scorching sunlight or the foliage will wilt. Water well until plants are established and water and mulch regularly if you're experiencing a dry summer. The roots will split and form comedy legs if you allow the soil to become too dry. The roots should be ready to harvest three or four months after seeding, Not only do you get two for one with this veg, you can also harvest it any time between late summer and mid-spring the following year. Leave roots in the ground until required, as they improve after exposure to autumn frosts. If you're harvesting in winter, cover your crop with straw or bracken to prevent the soil from freezing. Parsley root is most often eaten cooked, but it can also be eaten raw. Cook parsley root sliced or cubed like you would other roots such as turnips, parsnips, and carrots or as you would celeriac or asparagus. Roast, sauté, fry, boil, steam, or add parsley root to soups and stews. Parsnip root partners well with barley, beets, cabbage, chicken soup, horseradish, oxtail, root vegetables, shallots, sweet potato, and thyme. It has many culinary companions, including truffles, apples, fennel, potatoes, almonds, hazelnuts, cinnamon, aged cheddars and sheep's cheeses, butter, garlic, pork, poultry, lobster and smoked fish. To prepare parsley root for cooking remove the leaves and fine roots and then gently scrub with a brush to remove any soil. The peel is tasty so don’t peel or scrape off the skin. Trim off the greens, wash and dry them and reserve for used like regular parsley. Small roots can be used raw whole, sliced, diced or shredded in a winter salad. Shredded parsley root and celeriac combine well for a raw salad. Sprinkle cut areas with lemon juice to prevent discoloration. Prepare parsley root by itself creamed, puréed or simply steamed or boiled and buttered. Use one part boiled parsley root to 3 parts boiled potatoes and mash. Dried roots can be used as a flavouring: dry them on a shallow baking tray in an oven heated to 170°F (77°C); cool before storing in an airtight jar in a dark place. The leaves can also be used as a fresh garnish or salad herb or as a pot herb in soups and stews. The leaves have a slightly stronger flavour, so use a little less than you would normally. Do not separate root from leaves until ready to use. Parsley root will keep in the refrigerator for up to a week if you first wrap it in a paper towel and place it in a plastic bag. The leaves will keep for just 1 or 2 days. The roots can be stored in moist sand in the shed, but will lose some of their sweet taste. Parsley root evolved from a wild plant native to the eastern Mediterranean region. Though cultivated varieties are grown throughout the Northern Hemisphere in both the New and Old World, parsley root remains commercially relevant as a culinary crop primarily in Central and Eastern Europe. Parsley root was first used for cooking in Germany in the sixteenth century. It is called Hamburg parsley, which is a designation signifying 'rooted'. It is also known as Dutch parsley, Rooted parsley, Turnip-rooted parsley, Heimischer, Rock Selinen, and Rock Parsley. In Germany the Hamburg 'Half-Long' is known as 'Hamburgrooted Halflange'. It is one of several vegetables and herbs known as Suppengrün or soup greens which are combined with beef or poultry and boiled and used as soups and sauces. Parsnips are among the closest relatives of parsley in the family Apiaceae. A similarity of the name of parsnips to turnip is a coincidence, parsnip meaning 'forked turnip'; it is not closely related to real turnips biologically.